You see, I’ve had this irrational fear of cooked sugar for years now. No idea where it came from, because as a child I boiled my way through my mom’s candy cookbook without a second thought. Perhaps I ruined a pan or two at some point in my life, unable to scrape the rock-hard mass out of the (supposedly) non-stick surface. Whatever the reason, I’ve been scared to attempt any sort of cooked-sugar confection, let alone caramels, for quite some time. But to be honest it really wasn’t that hard, and I even made it complicated by adding peach puree to the recipe (disclaimer: you can’t even taste the peach). I kept the candy fairly light in a (failed) attempt to keep the peach flavor front-and-center, but if you prefer a darker, more robust caramel flavor you can cook the sugar slightly longer. This will produce a firmer caramel, so you may want to increase the cream as well. The peach is practically invisible in the final product, unfortunately. If you concentrate really hard you may be able to discern a slight fruity finish, but without knowing that there is basically an entire peach’s worth of fruit in there, you’d think they were just regular vanilla caramels. I think some other kind of fruit might be more effective at flavoring the candies, and in fact I might try the same process with the blackberries I have stashed in the freezer or the exotic lychees I found at the Asian market last week. My only other qualm with the final product, other than the lack of peach flavor, was that the candies felt slightly greasy. I don’t know if it was the butter or the non-stick spray or something I did wrong in the process, but I’d like to find out how to make them less greasy in the future. But look! Real, honest to goodness caramels! Line an 8×8 baking dish with parchment paper, leaving a slight overhang on two sides. Lightly butter or spray the parchment and the sides of the pan with nonstick spray. In a small 2-quart saucepan, warm the cream, butter, and salt over medium heat until the butter melts. Remove from heat and stir in peach puree. Combine the sugar, corn syrup, and 1/4 cup water in a large, 4-quart heavy-bottomed saucepan (do not use a smaller pan here as the sugar mixture will bubble and eventually triple in volume). Stir until the sugar is evenly moistened and forms a thick grainy paste. Brush the sides of the pan with a damp pastry brush to remove any stray sugar crystals. Clip an instant-read thermometer to the side of the pan so the tip is completely immersed in the sugar. Cook sugar mixture over medium to medium-high heat, resisting the urge to stir, until the mixture boils and reaches 250°F. If you want firmer caramels, continue to cook the mixture up until 320°F. You may need to tilt the pan to get an accurate temperature reading, depending on your thermometer. When the mixture reaches 250°F or desired temperature, remove from heat and carefully whisk the warm cream mixture into the sugar syrup. The sugar syrup will bubble violently. Stop whisking once all the milk and butter mixture has been added. Return the pan to medium to medium-high heat and bring to a boil, again without stirring. Remove from heat when the caramel reaches 245°F to 250°F and darkens to a light golden color, about 15 to 20 minutes. Quickly whisk in the vanilla. Immediately pour the caramels into prepared pan, without scraping the bottom of the pan (there are sometimes hard burnt bits on the bottom). Knock the pan against the counter a few times to help air bubbles work their way out. Let sit, uncovered at room temperature for at least two hours or overnight. The pan can be covered only when the caramels have cooled to room temperature. To cut, lift the caramel block out of the pan with the parchment paper flaps and transfer to a cutting board. 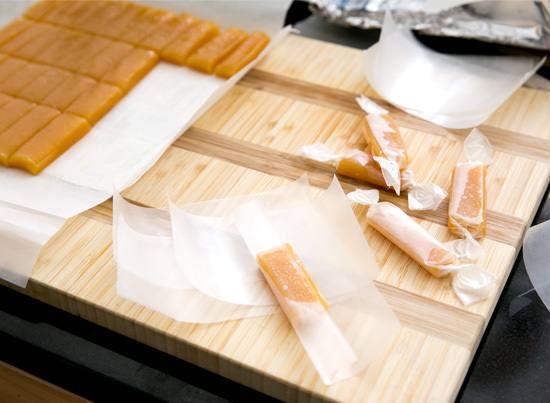 Cut the caramels into candies with a very sharp knife or a rotary cutter sprayed lightly with nonstick cooking spray. Wrap each caramel in a piece of waxed paper cut slightly longer than the length of your caramels, and twist the ends closed. Caramels will keep at room temperature for about two weeks. Yay!!!!!!! These are on my scared to make list too. They are so pretty!! I love a good caramel, and this recipe is fabulous! LOVE this! Go you is right! Those are beautiful! Congrats in facing your fear & finally making that caramel! Looks lovely! Woohoo! Congrats on conquering your fears! I have never tried to make fruit caramels; I make a mean salted caramel, but haven’t ventured outside of that. After going to the Summer Fancy Food Show, I tasted an unbelievable variety of caramels and realized that I need to expand my caramel repertoire. I may need to add these to the list! 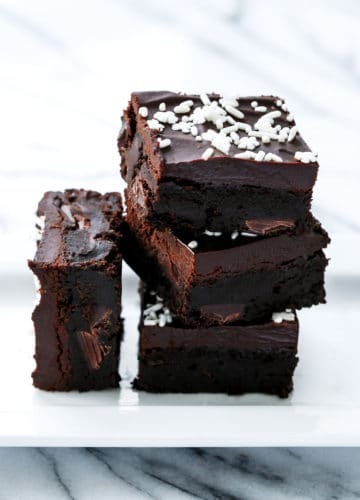 These were delish, thanks for sharing! love these! I just shared on my Facebook fan page! Woohoo! Cooked sugar IS a little scary, you are totally justified in feeling that way. But way to go! These look delicious, and I think the little hint of peachiness might be a good thing in a yummy caramel. Wow, peach caramel sounds tasty! I wonder if adding more peach purée would increase the peach flavor? 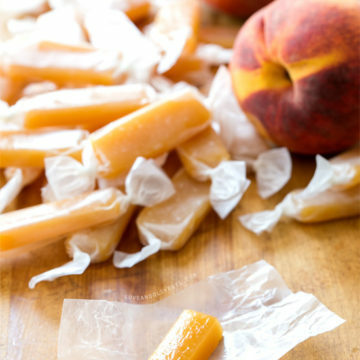 I really want peach caramels now!!!! 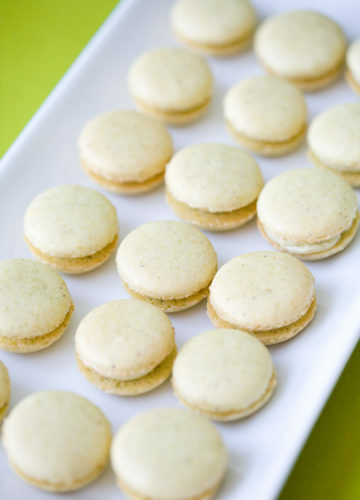 I agree with your caramel fear, mine extends to macaroons as well, or pretty much anything I’ve messed up in the past. Thanks for sharing it is giving me motivation to try something I’m scared of. What’s the worst that can happen? I’ll give it a go again soon, promise. I got over my caramel fears about a year ago…but only after ruining tons and tons of batches and candy thermometers. So I tried some microwave caramel recipes and am hooked and sold. Never, ever thought it could work but it does. 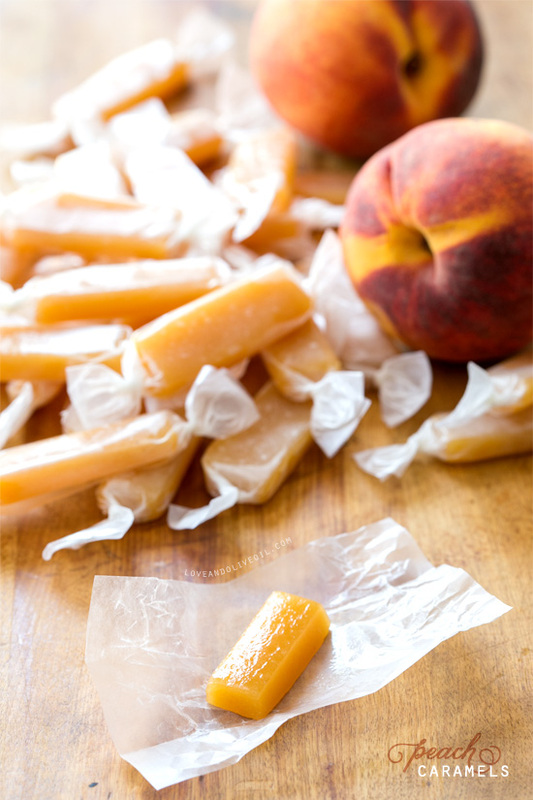 I am so impressed by your peach caramels. I wish I had them right now! Oh wow… these sound amazing! I’ve never thought to infuse fruit flavor into caramels. Thanks so much for sharing! Consider this pinned! These are amazingly gorgeous! I love peaches and would love to try this unique spin on them. Absolutely delicious! when i make apple cider caramels I start with like a cup and a half of cider and reduce it down to 1/2 cup. This might work to increase the peachiness of these. I am definitely going to try this!! So impressive! These are incredible! Caramels are scary but yours are lovely! I’ve made some good ones followed by some really terrible, oh, god is that pot salvagable ones! I’m really bummed that you can’t taste the peach. Maybe some peach extract. Do they even make that? They are looking sooo attractive! Making candy seems fun I’d love to try it with ur recipe :) Thank you! What a unique idea! getting out of your comfort zone in the kitchen is definitely scare, but these are beautiful! Yay for you! I have yet to attempt candy. I LOVE your pictures. Also: homemade caramels!? So impressive! Great for you! I’ve never made caramels – cooking sugar is both intimidating and bothersome for me. But it’s always awesome to conquer your culinary fears, so yay for you! I made some apple cider caramels last year that were fantastic! The apple flavor really came through because the recipe reduced 4 cups of cider to between 1/3 and 1/2 cup, making it a thick syrup. 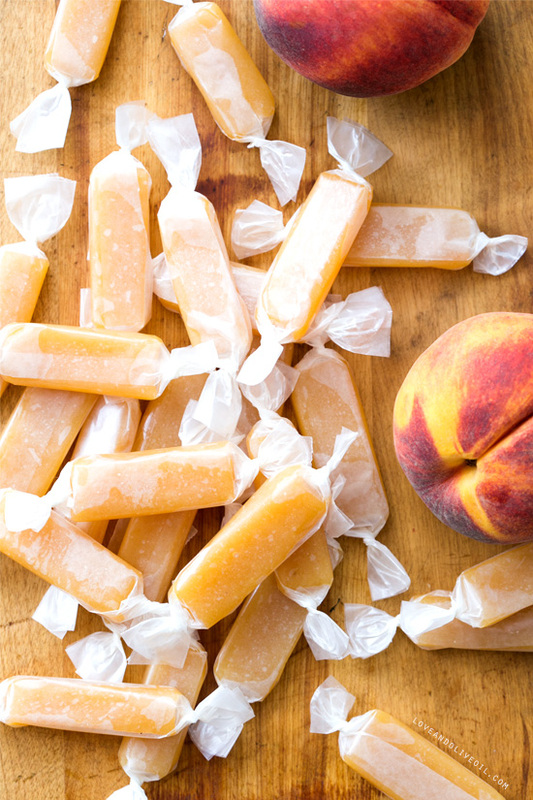 I wonder if straining the peach puree with cheese cloth and reducing the juice in a similar manner would result in a stronger peach flavor for these caramels. I plan on experimenting with peaches and other fruits this year! Oh, I can’t even handle the thought of peaches and caramel together without drooling! 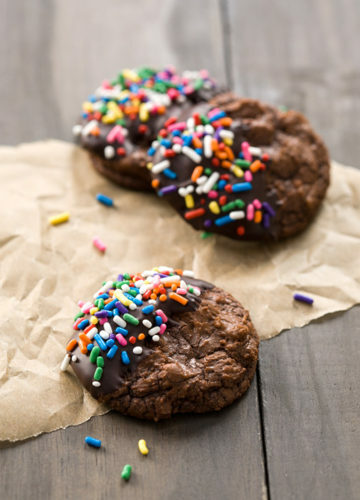 Seriously, these look incredible and I’m so happy you conquered your fear to make these! This post made me laugh, a lot. Good job on facing your fear. I have serious caramel anxiety. I always stress when making it. Do you make any caramels that don’t use corn syrup? Here is one my husband used. The carmels turned out wonderfully. 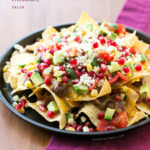 I love everything about this post, but mostly how they didn’t turn out exactly as you thought they would, but still posted the recipe anyway. It’s too bad the peach flavor didn’t come through more, because that sounds like such a great caramel candy flavor. They still sound great and look beautiful though! I had problems with greasy caramels until I decided to wipe out excess cooking spray from the pan. So spray with cooking spray, wipe off most of it with a napkin. Should be mostly non-greasy! OMG! Yum! Pictures are fantastic. These sound so tasty! I don’t like cooking with hot sugar because I am afraid of burning myself. Looks really easy and yummy. 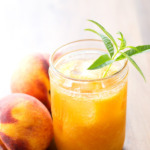 Maybe replace the peach puree with a more concentrated flavor like a peach butter? 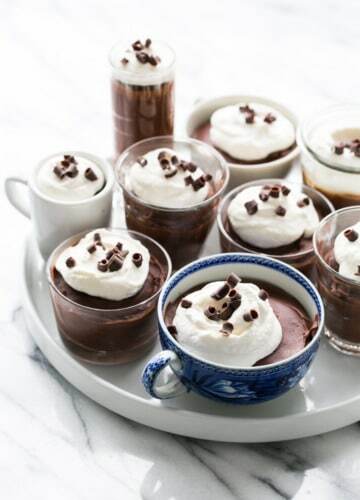 Can you use carnation milk instead of whipping cream? Amazing! From she re is your cutting board? Thanks! Hi I liked the recipe- I tried it without spraying the parchment paper it worked out fine came off without sticking so that may stop them from getting greasy!